Horizons Marijuana Life Sciences Index ETF – HMLSF is testing resistance around the $15 level. This level was the top in February and March. It is overbought so it may pull back over the next few days. 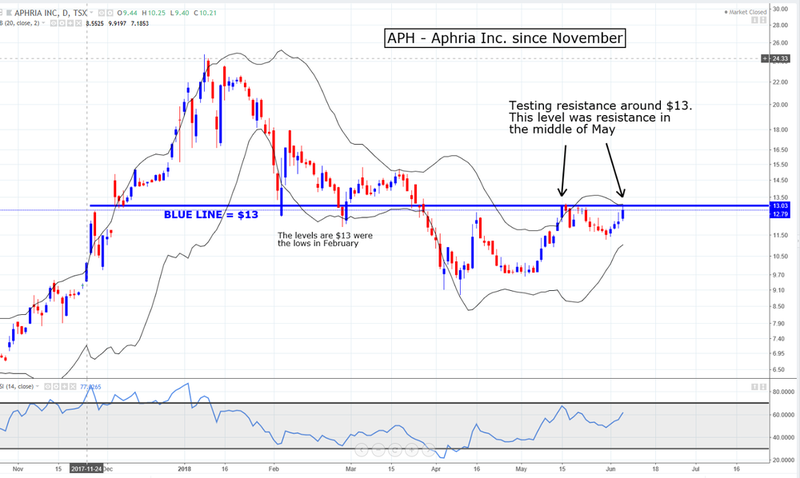 Aphria Inc – APH is testing short-term resistance around the $13 level. This level was resistance in the middle of May. It was also support in February. Canopy Growth Corporation – WEED is testing resistance around the $42 level. This level was the top in January. It is slightly overbought so it will probably consolidate here for a few days. 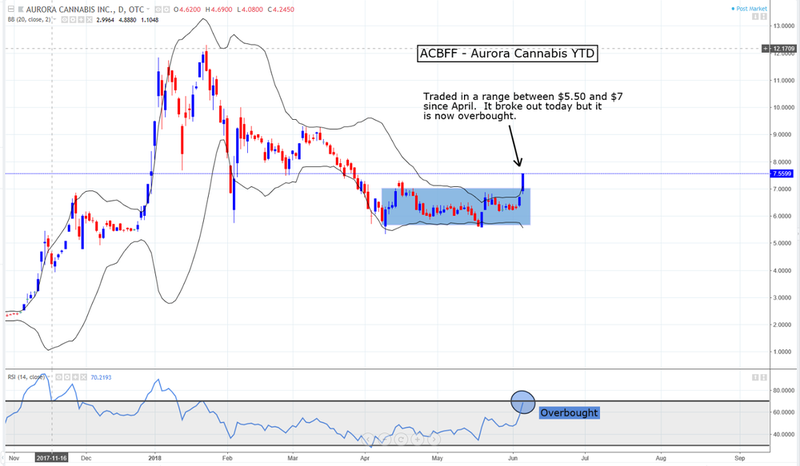 Aurora Cannabis Inc. – ACBFF traded in a range between $5.50 and $7 since April. It broke out of that range today but it is now overbought. Cronos Group – CRON is testing resistance at the $8 level. This level was the top in April. It is now overbought. The recent lows have been at the $5.50 level. Important support and resistance levels have not been developed yet, because the trading history isn't long enough. It takes time and volume to make a particular price level relevant or important, and most of these companies haven't been trading at these levels for enough time for these dynamics to have developed. However, there will probably more support and demand at round levels like $10 or $20 due to their psychological importance. The Canadian / US Dollar exchange rate needs to be considered, especially if you are going to hold them for the long-term. Obviously, fluctuations in the currencies will affect returns. Many of these equities are Canadian Companies trading on Canadian Exchanges. The Canadian dollar is strongly influenced by the price of commodities.